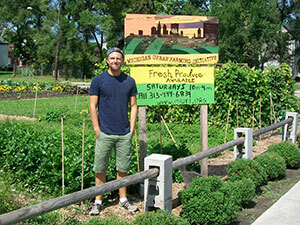 He established the all-volunteer organization in 2012 with fellow U-M student Darin Mcleskey to provide fresh healthy food to low-income families and to support the local community. Beyond growing food, its mission involves fixing up nearby buildings, converting some into ag-related structures like a retention pond and others into assets like a community center and veterans’ housing. Volunteers are also working on tech, developing data metrics they believe will help other urban ag projects grow. Last year the garden harvested 12,000 pounds of produce. Food went first to individual households on a pay-as-you-can sliding scale, then to local markets, restaurants and charities. Since its creation, MUFI also has hosted more than 3,500 volunteers at the site, who’ve contributed over 35,000 hours of service work. The initiative is a multifaceted effort that brings together people from many backgrounds: locals, college students and even volunteers from foreign lands. Fortunately, Gersh has experience navigating different worlds. Born to American military parents, his first home was Germany. At the age of three, his folks separated and he moved to the states. He spent his early years bouncing between his mom’s home in the college town of Ann Arbor Michigan and his father’s base of operations in the small rural Texas town of Belton. His mother stayed enlisted, while his dad drove semi-trucks and later launched a successful truck shop company and an Idaho-based snow tubing attraction. As a teenager, he took up high school swimming and rowing. These experiences taught Gersh about overcoming self-imposed barriers and the power of working collectively with other individuals. His higher education has included stretches at Washtenaw Community College, U-C Berkeley and the University of Michigan’s Ann Arbor and Dearborn campuses. Fascinated by the science of the mind, his research has included both affective neuroscience and the behavior animals at play. Right now he’s completing an undergraduate degree in social psychology at U-M Dearborn. During his early college years, he got hands-on practice for his urban farm endeavor working in landscaping and volunteering with groups like Washtenaw Rainbow Action Project and the Humane Society. He even spent a month abroad in Guinea in 2007 developing a reserve for an endangered tree used to make drums. In 2011, a job as a research assistant for the community oral health intervention project sparked Gersh’s interest in the relationship between food and social justice. During one educational session he met a young mother who fed her infants bottles of orange soda she thought was orange juice. These and other experiences opened his eyes to both the devastating impact of structural inequality in Detroit and the pressing need for food security. Around this time, he met Mcleskey at a meeting of a Detroit-Ann Arbor service learning group. The two hit it off. 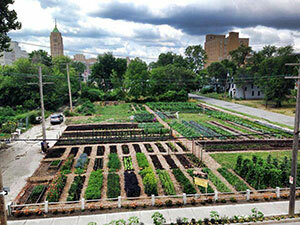 They both loved urban ag, and Mcleskey knew real estate and owned land in Detroit. Pooling their money together, they bought a structure at 7432 Brush Street in the city’s North End neighborhood and the initiative was born. Mcleskey has since left the project to pursue a career in realty. Gersh has remained, fueling MUFI with money from Facebook contests, attracting and energizing volunteers and bringing neighborhood folks into leadership roles on MUFI’s board. Gersh describes the initiative as riding “the line between social justice and innovation.” Just where is that line headed in the next few years? MUFI’s president is quite optimistic.